Angie Zurovec hopes to land a job in a school setting after she graduates with her master’s in Occupational Therapy this month. No matter where she finds herself working with patients, she already knows they will benefit from strategies she learned in an art class aimed at teaching doctors and other health professionals how to deepen their observation of patients. 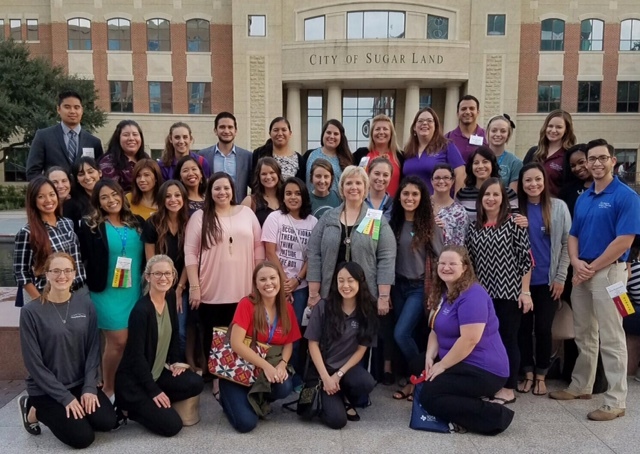 Those visual thinking strategies featured heavily in “The Art of Observation,” a presentation by Zurovec, fellow graduate student Gayle Tabotabo and Dr. Bridgett Piernik-Yoder, associate professor of Occupational Therapy, at the Texas Occupational Therapy Association (TOTA) Mountain Central Conference last month. The trio’s presentation was based in part on an interprofessional elective course Piernik-Yoder has taught, Art Rounds. Offered through the Center for Medical Humanities and Ethics, Art Rounds opened to the School of Health Professions two years ago. “The elective focuses on visual communication skills and observation skills, which then translate into preparation for the clinical setting,” said Piernik-Yoder, who last month was awarded the 2016 School of Health Professions Shirlyn B. McKenzie Scholarship of Teaching Award. As for Zurovec, she found herself using the visual thinking strategies while in her second clinical rotation. “What else is going on?” Zurovec recalled intentionally asking herself, as an example of how she practiced deeper observation of patients. About 50 students from all three classes attended the TOTA conference and 14 participated in seven student-led presentations, Piernik-Yoder said. Their presentation topics also included early child mobility and the use of canines as a therapeutic modality, she said. The number of students participating in the conference has grown each year, as have the number of student presenters. Piernik-Yoder noted that all students are members of TOTA and those who present gain an edge in their job search.